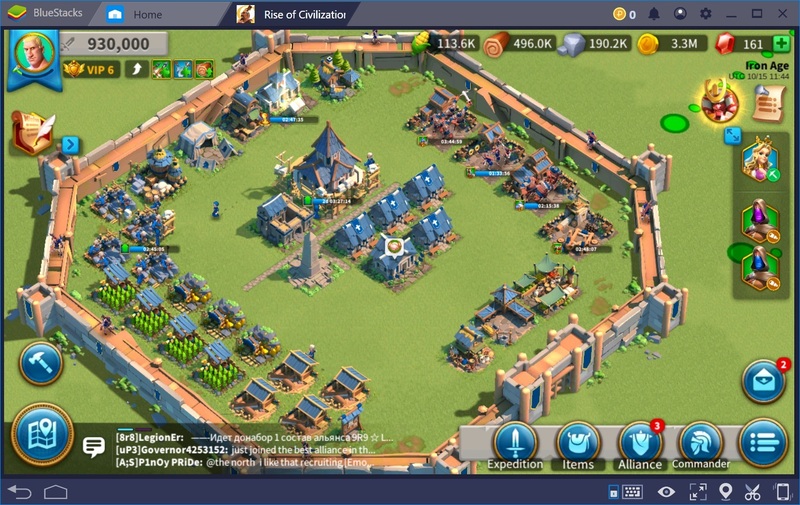 Developing a stable, prosperous city in Rise of Kingdoms is not an easy task at all. You begin the game in charge of a pre-historic, Stone Age civilization. As you gain levels, your city keeps progressing through 4 subsequent ages: Bronze, Iron, Dark and Feudal. Each age allows you to dispatch and command more and bigger armies. However, in order to do this effectively, you will need to have a strong and powerful city. Such a city requires careful planning and a lot of patience. After all, your city is what you will have to spend most of your time and focus on. In this guide, you’re going to find out all the information you need to build the city of your dreams. City Hall is hands down the most important building in Rise of Kingdoms. Everything begins and ends with it. Therefore, upgrading it as high as possible, as soon as possible, is of utmost importance. Upgrading your City Hall throughout its Stone Age progression and well into the Bronze Age is fairly easy. However, once you enter Iron Age, you will notice it takes a lot more time and effort to level it up. As a rule of thumb, do your best to keep every other building in your city on the same level as that of the City Hall. 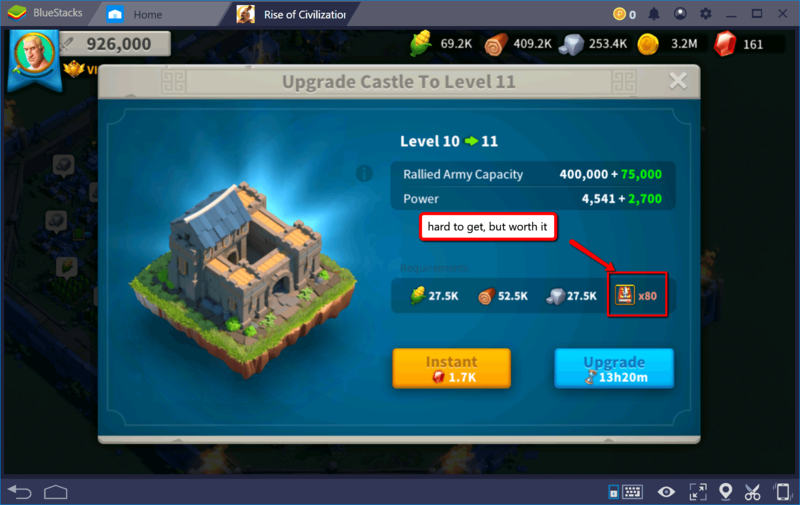 This will prevent a scenario where you have to upgrade one particular building several times in a row just to be able to begin upgrading your City Hall right after it. Last, but not least, do your best to reserve most of the speed ups for City Hall. For example, you will manage just fine with a lower level of the third Goldmine, but getting stuck at any particular level of your City Hall for too long will seriously stunt your growth. 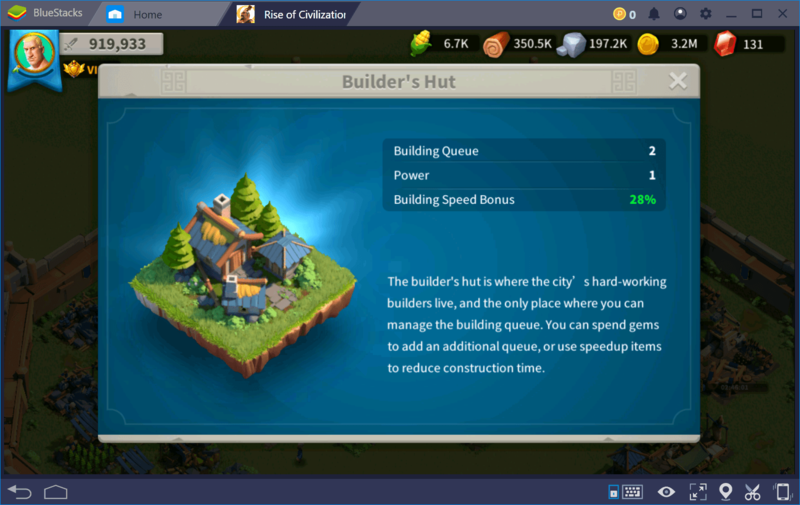 Builder’s Hut is one of the few buildings in your city that don’t require leveling up, but is critically important for the development of your city. By default, it enables you to queue one building construction/upgrade at a time. At the beginning, you will be given a couple of boost items which will enable you to queue up two buildings simultaneously. Unfortunately, these items will only last you for a few days each. 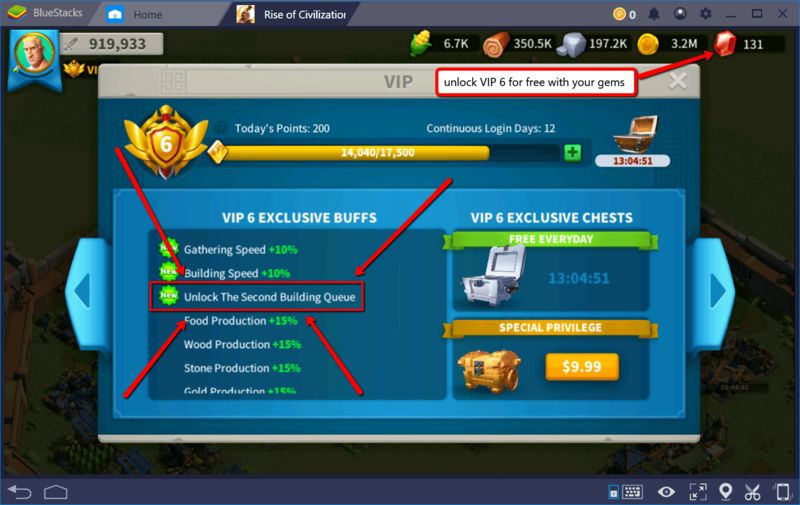 It is crucial that you DO NOT waste your Gems on anything else before upgrading your VIP to level 6. This VIP level permanently unlocks the second building queue in the Builder’s Hut, allowing you to always have 2 buildings on the countdown. You will be getting a lot of free gems from events and City Hall upgrades in the early stage of the game. It’s easy to throw them away on all kinds of items. Don’t do this. Get that VIP 6 instead and double your growth forever. In order to command huge armies, you must have Commanders at your service. Every nation gets one default epic Commander from the start. Tavern is a place where you will eventually unlock other Commanders such as Julius Caesar, Joan of Arc and Cleopatra. Every Commander has its strengths and weaknesses. You will use them for various purposes, based on their skills and talents. Besides new Commanders, Tavern is also a place where you will get a range of other items. Based on the Tavern level, you get a couple of free Silver Chest keys every day. 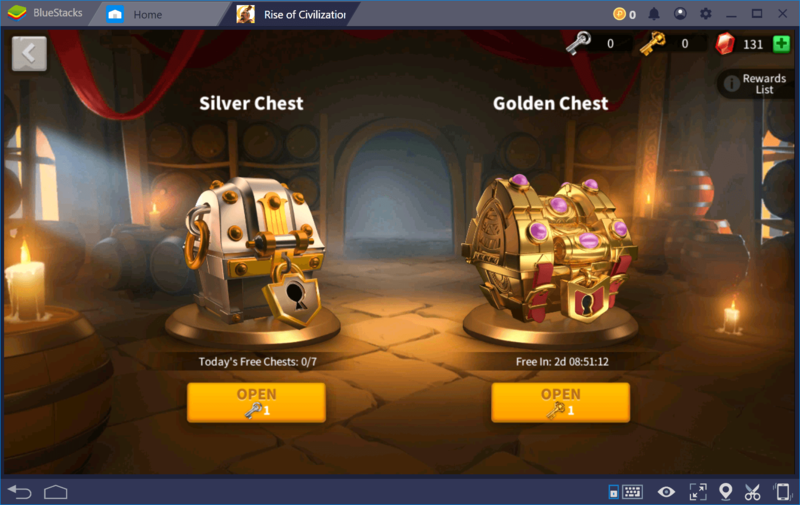 You also get one free Gold Chest key approximately every 2 and a half days. You will get additional chest keys from quests, objectives and all sorts of loot in-game. Don’t forget to use them. Academy is your hub of knowledge. Every city needs bright minds to become a better place. So does yours. 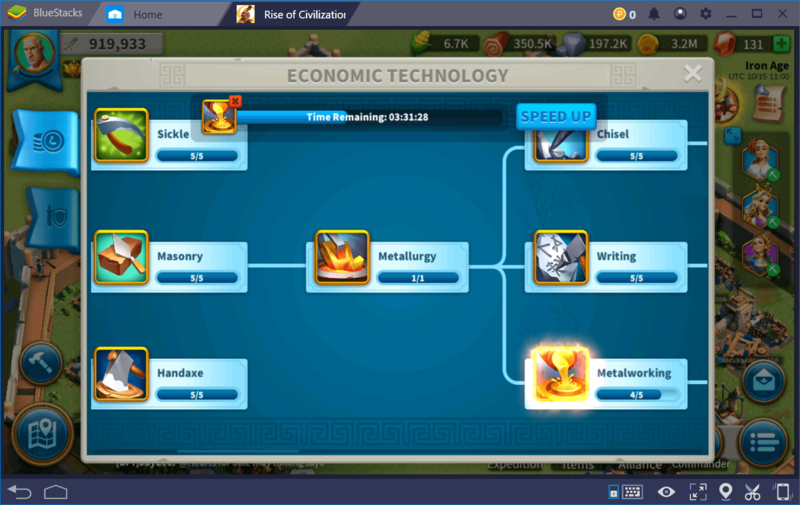 In Rise of Kingdoms, research and technology is divided into Economy and Military. If you want to grow and develop your city, Economy upgrades are a wise long-term investment, as well as a prerequisite for some higher level buildings. Strong Military technology is the backbone of city security and expansion. Don’t neglect it too much, even if you don’t go out and battle that often. You don’t want to catch yourself short on well trained troops once trouble comes knocking on your walls. Fog exploration is extremely beneficial in the initial stages of your city. Tribal Villages, scattered across the map, give out free troops, resources and Tier 1 Economy research upgrades. Mystery Caves have loot ready for the taking. Get your Scout Camp at least to level 5, preferably 11. 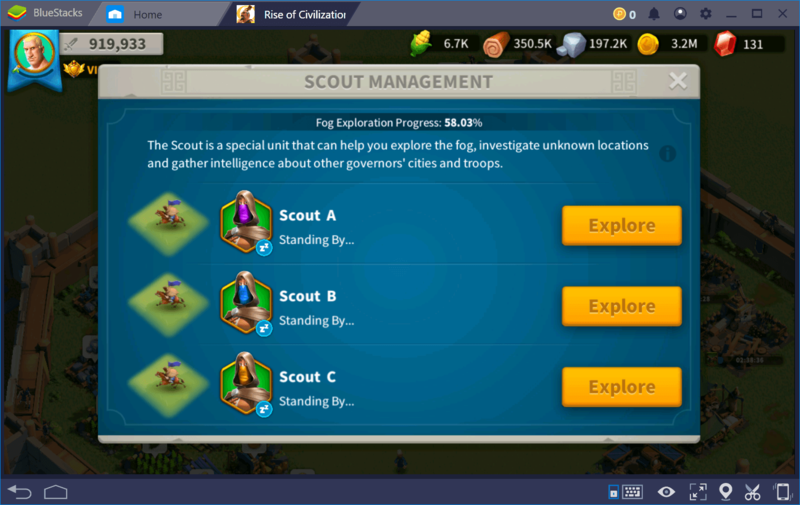 This unlocks additional scouts, doubling or tripling your ability to explore and reap rewards beyond the borders of your city. Food, wood, stone, and gold are the fuel behind any building and research upgrade. 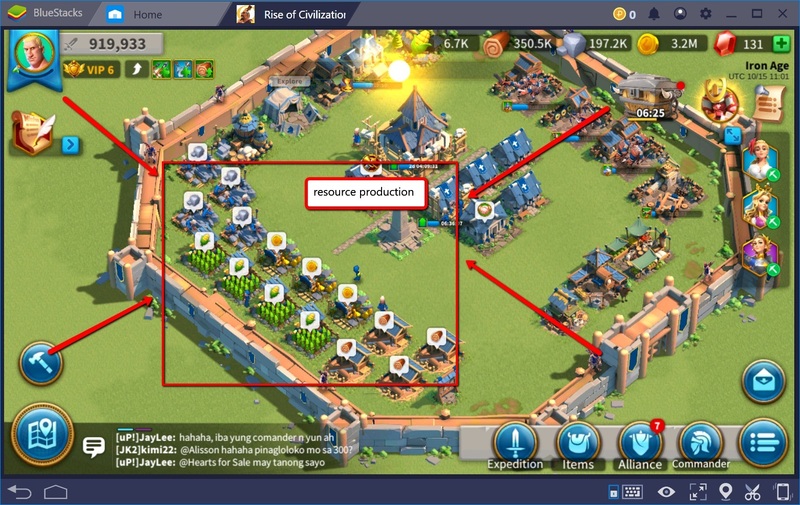 You can have a maximum of 4 production buildings for every resource. It’s not entirely necessary for each and every one of them to be at the max level. 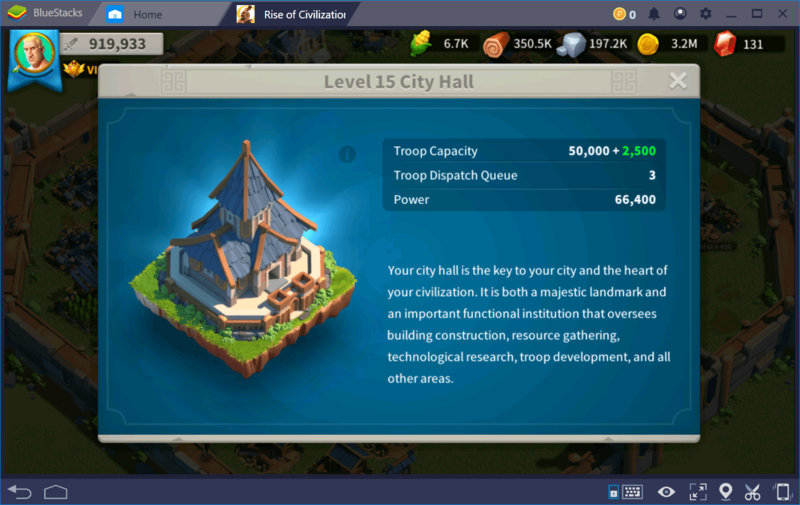 However, keep at least 1 building of each resource type around the level of your City Hall. Make sure you don’t catch yourself having to upgrade any one of these buildings several times in a row as a prerequisite for some other building. It will slow you down significantly. Don’t forget about Storehouse either. Upgrade it accordingly to protect your resources from being plundered. Always aim to have all your resources below the maximum protection threshold. Somebody will eventually send their scouts your way, and if they see you have a couple of million resources, you might as well kiss them goodbye. Training new troops in Rise of Kingdoms is quite straightforward, albeit a bit slow. 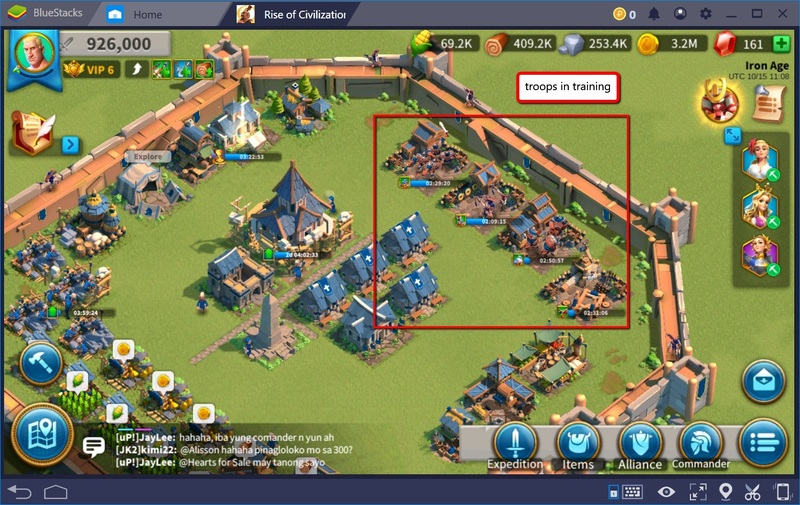 The higher the building level, the more troops you can train at once. Training speed can be increased with items, Academy & Alliance research as well as VIP levels. Luckily, troops don’t die that often, but a certain portion of your army will always end up severely wounded and in need of hospital treatment. 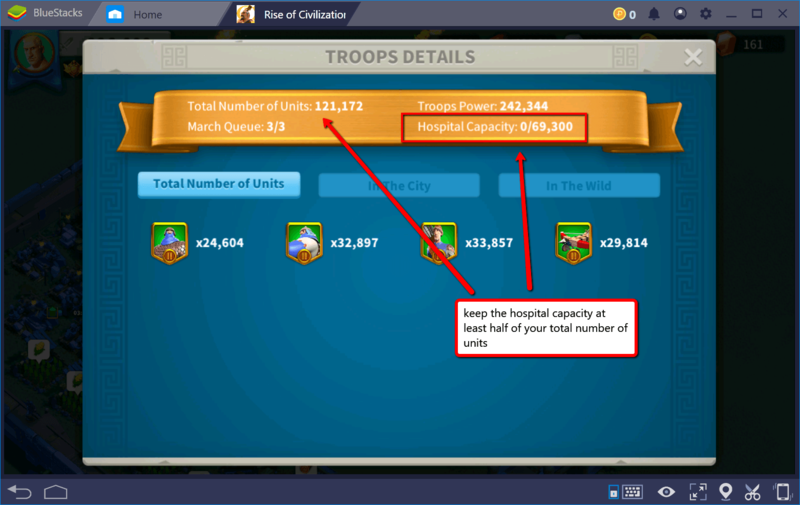 Based on the severity of battles you get involved in, upgrading your Hospitals to at least half your total troops capacity is a wise long-term investment. In PvP, thousands of troops can end up severely wounded in a single battle. If your Hospitals don’t have the capacity to treat them all at once, they will perish. Trust me; it hurts really badly when you lose a couple thousand troops just because you neglected your Hospital capacity. Becoming a member of a strong alliance is only half the job done. 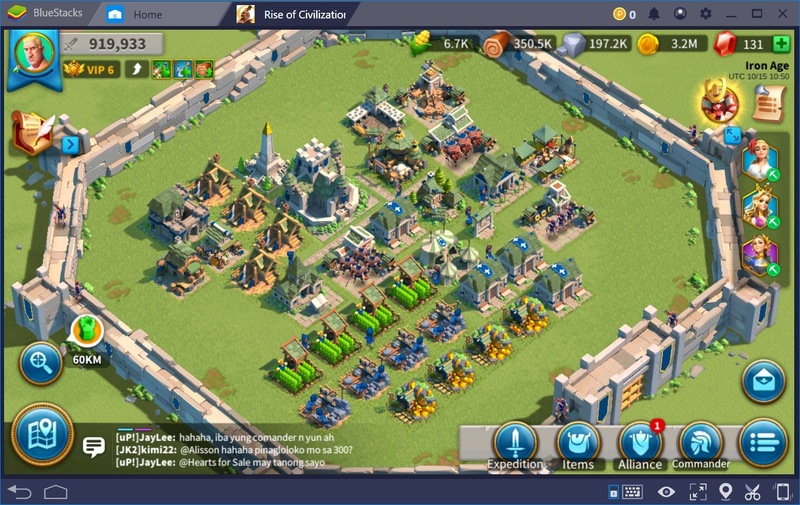 Castle is crucial for rallying Barbarian Forts, Passes, Holy Sites and hostile players. While not the easiest building to upgrade (it requires a rare resource called Book of Covenant), once you are able to level it up, do it as soon as possible. Shop and Courier Station serve a similar purpose. Due to the fact you don’t have to upgrade them, they’re not too much of an investment. 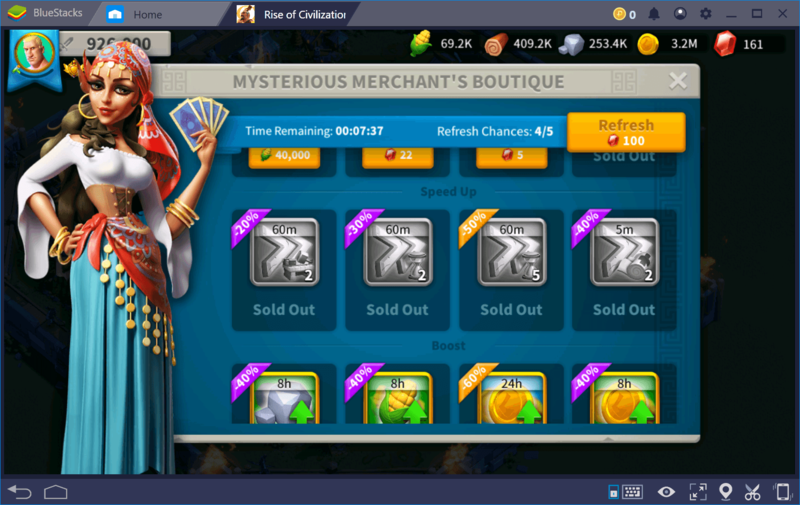 However, Courier Station provides random discounts on the same items you get from the Shop, so it’s best to ignore the higher priced items from the Shop altogether and stick with Courier Station. Finally, there’s Trading Post. The higher its level, the less tax you have to pay when sending resources to other players. If you engage in a lot of trading, you’ll be forced to upgrade it to its highest level. Otherwise, just keep it high enough to be able to upgrade your City Hall. 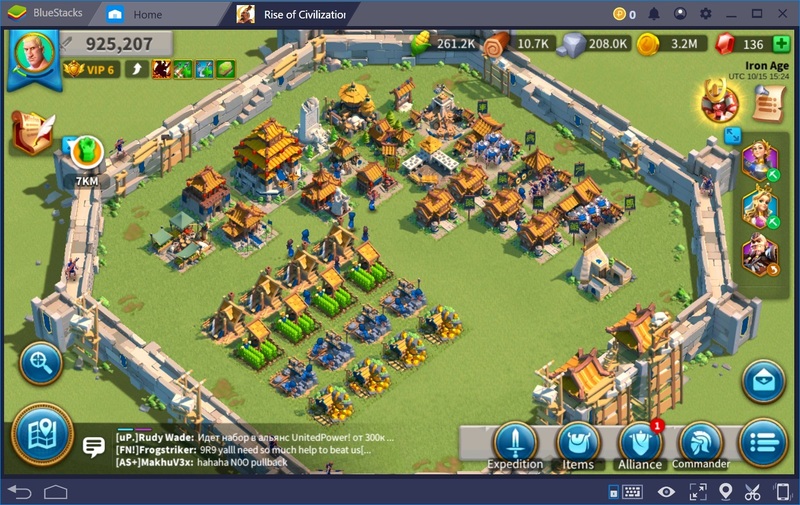 Creating the best Rise of Kingdoms city is not all about the numbers either. Having the highest possible levels of all buildings is important, but something can be said about making them all look nice and orderly. Beauty is subjective. However, keeping everything in its proper place will not only make your city look better, it will also help you keep a mental check on everything that’s going on inside. As a rule of thumb, try to group up buildings by their type and purpose. Resource production on one end, military buildings on another, and so on. There are multiple ways to do this, of course. Here are a couple of examples for you to take ideas from. 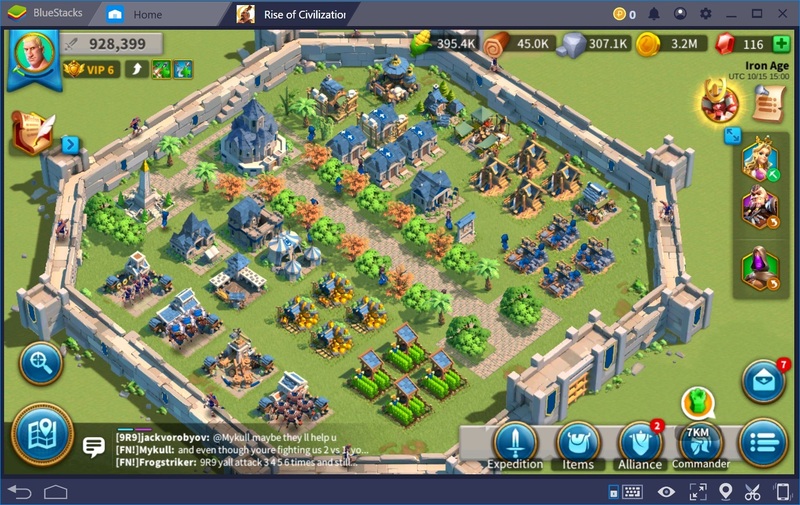 Now that you have all the information you need about building a dream city in Rise of Kingdoms, we don’t wanna stand in the way of you having fun. Jump right into the game and implement all that you have learnt here. See you on BlueStacks. Don’t forget to like, share and comment on this article to let us know what you think. We love hearing from you!